he lit the rocket and-she-oop! It shot up through the ceiling." Long before Richard Scarry or Dr. Seuss, an American artist delighted a generation of children and their parents with hilarious, topsy-turvy illustrations and slightly subversive tales told in rhyme. This was illustrator/author Peter Newell. 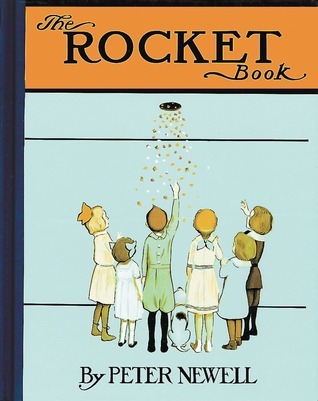 Originally published in 1912, The Rocket Book remains as profoundly enjoyable and incredibly popular as ever. This classic work will delight readers of all ages with the story of how a rocket launched from the basement floor of an apartment building and how it interrupts the day. Peter Newell (1862-1924) began his career as an artist drawing portraits, using crayons as his medium. In his fantastic humor, many believe, is the first appearance of the gentle humor of the absurd which The New Yorkerhas subsequently developed to such a high level. Oh my, what a fun book to read The rhymes were charming. We see the consequences of on bad act and how they are perceived. The janitor's son finds a rocket in the basement and lights it. The rocket takes off and goes through each of the floors above it. On each floor we have a different incident taking place that is destroyed by the rocket coming through. The people in the apartments seem to be oblivious to what truly happened until it reaches the top floor. I loved the way each floor had a two stanza rhyming poem to explain what happened. I would definitely recommend this book to everyone. This is one of those charming books to be enjoyed by young and old alike. The pictures definitely have an old time feel. If I were to meet the author I would have to say, "More Please."